This utility solves one major problem yet unsolved when working with the Paper Space: It is hard to easily get uniform linetype scale. Setting the PSLTSCALE variable to 1 (ON) forces you to set the LTSCALE variable to 1. This is somehow annoying because you must pop the original LTSCALE value when you switch back to the Model Space. 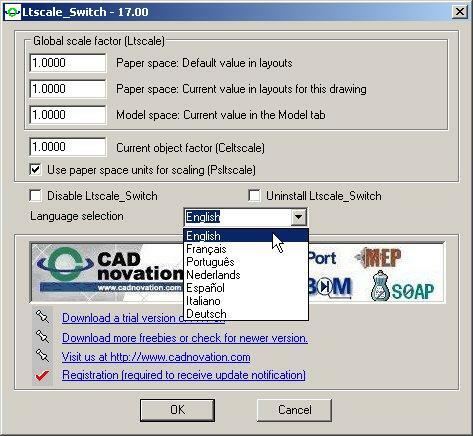 The LTSCALE Switch is an ARX utility that automatically saves the LTSCALE value when switching from the Model Space to Paper Space, then sets it to 1. It restores the value when you switch back to Model Space even if you quit the editing session within a Paper Space tab. All that in real time . Suggested solution in 2007-2009: Use the Installation Wizard. The Wizard will registered the LTScale Switch for self loading in the current AutoCAD. If you have many vertical AutoCAD of the same release, use the next solution for each of them. Alternate solution and previous releases: You need to copy the LTScale_Switch_2007.arx1 file in one of the AutoCAD search path and load it once. It will be self-loaded next time so you will never need to care about it anymore. A button is dispayed in the status bar to let you toggle from active or sleep mode or set new parameters. The Ltscale_Switch utility works by itself by using its own parameters. To modify these parameters, right-click the button 'Ltscale_Swith' in the status bar then select Settings. Paper space: Current value in layouts for this drawing means that value won't change for this drawing even if you change the default value. Select a language from the drop-down list. Current supported languages are English, French, German, Italian, Neederland, Portuguese and Spanish. Right click on the 'Ltscale_Switch' button like the one shown earlier then choose 'Settings'. Set LTSCALE for the current drawing to 2 in paper space and 10 in model space. Close the dialog box. To verify that the mechanism works both ways, let's get back to the Model Space tab. In previous release, a special variable was needed to fix a Ltscale different from 1 in a paper space tab. This is no longer required. You simply need to change the parameters from the button in the status bar. Copyright © 2000-2006 by CAD Novation, a division of Consultants Univers inc. Permission to use, copy, modify, and distribute this software for any purpose and without fee is hereby granted, provided that the above copyright notice appears in all copies and that both the copyright notice and the limited warranty and restricted rights notice below appear in all supporting documentation. CAD NOVATION PROVIDES THIS PROGRAM "AS IS" AND WITH ALL FAULTS. CAD NOVATION SPECIFICALLY DISCLAIMS ANY IMPLIED WARRANTY OF MERCHANTABILITY OR FITNESS FOR A PARTICULAR USE. CAD NOVATION DOES NOT WARRANT THAT THE OPERATION OF THE PROGRAM WILL BE UNINTERRUPTED OR ERROR FREE. Use, duplication, or disclosure by the U.S. Government is subject to restrictions set forth in FAR 52.227-19 (Commercial Computer Software - Restricted Rights) and DFAR 252.227-7013(c)(1)(ii) (Rights in Technical Data and Computer Software), as applicable.